The shrewdly conceived "virtual" Twitter feed that will supplying news updates in Madden NFL 13's new unified career mode may be fully branded, and use the real names of real NFL insiders, but neither are supplying the actual content. Back in April, I was told that EA Sports hired one guy whose job was to write all of the Twitter content. He will have to have a range of voices—from the nails-on-chalkboard orations of Skip Bayless to someone more highly regarded, like Ross Tucker of the NFL Network. Reporters like Adam Schefter will also pop up and comment on rumors that actually have basis in the the league you're running, such as players you're scouting for the upcoming draft. Pastapadre today compiled all of the real-world media types who'll be "tweeting" in this video game. It doesn't appear that they will be doing so under their official Twitter handles. Screenshots show the tweets coming from alternate accounts with an "EA" appended to them. This probably is because the suite of online features in "Connected Careers" allows for your league to publish news through its own virtual Twitter feed, presumably letting you follow its developments from work the same way you would the real NFL's. 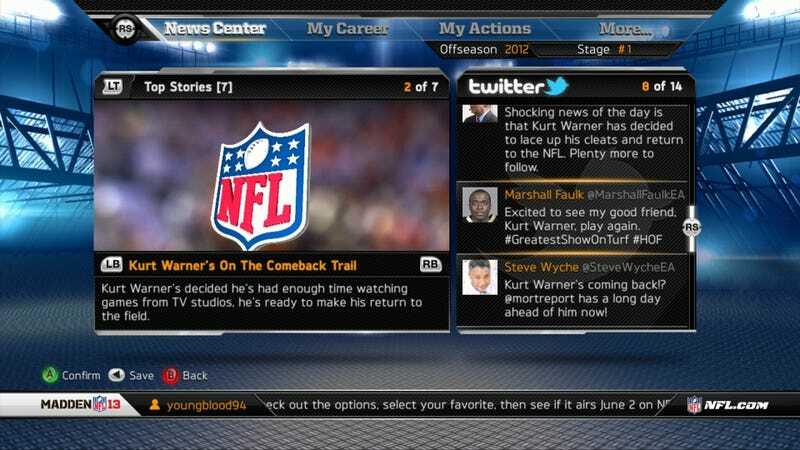 Here are all of the media personalities appearing in the virtual Twitter of Madden NFL 13's "Connected Careers".